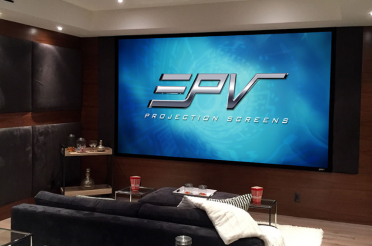 The Saker Tab-Tension Series from Elite screens is an electric projection screen with MaxWhite Fiberglass front projection material paired with Elite Screen’s tab-tension design for maintaining a flat surface. Thje Saker MSRP (not selling price – big difference) from Elite Screens is about $1500. This is Elite’s model number for my screen as configured: SKT120XHW-E20. Full disclosure before starting, consider this strictly an end user review (or perhaps “pro-sumer”). This is my first screen at home, although I’ve owned a projector for several years. All my past usage (at home) has been using a white or light gray painted wall. (***not projection specific paint), with a business projector, but for the past year, I’ve had a good home theater projector (an Epson UB series, that I bought used), and this Elite Screen’s 120″ motorized screen. This screen is suitable for both commercial and home use. This award goes to projectors or screens that are a cut above but may have a rough edge. Or, it goes to a more specialized product. I have used some screens in the education world (in my teaching days), some smart boards, regular pull down screens, and some larger auditorium screens. 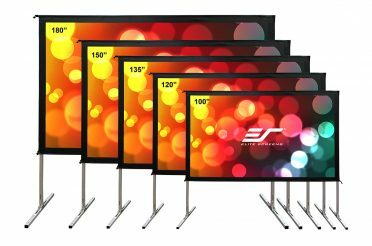 However, there is no way I could reasonably compare my usage of those with this current screen, nor do I have much knowledge of any competitors in this class of motorized, 120” white tab-tension screens, other than to say that Elite is known for making affordable quality screens (which come to us from China). 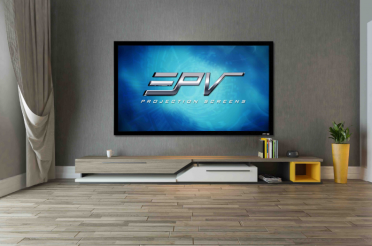 Elite Screens: This Saker screen is part of their EliteAVPro group – which competes with slightly to somewhat more expensive screens from US companies such as Da-lite, Draper, Stewart Filmscreen (generally high end but they have an affordable (but not as affordable as Elite) line of screens known as their Cima series). Please keep in mind that while I tend to think of this screen primarily as a home theater screen, since that is its primary use when I’m not reviewing, certainly the Saker also works just as well for business and educational purposes, often better. In a bright room like mine in the daytime, for example I could do better with an ALR screen to reject side ambient light, etc. But, the vast majority of screens used in the business world are similar to this one. The flexibility I need in a screen for reviewing different projector types, could have made a light rejecting ALR screen a problem. Consider, I have to review projectors that are standard throw distance, short throw and ultra shoert throw. A standard ALR screen won’t work for UST (and not well for very short throw). From a screen surface standpoint, the MaxWhite resembles the typical screen surfaces used in most schools and businesses. So, with that all said, I have a sizable high ceiling wall in my family room and the lens of my Epson 5020UB sits about 14 ft. from said wall. Installation was definitely a two person job. My neighbor and I took measurements, installed the wall brackets, checked that we were level, and we had the screen mounted, centered, and level in under an hour. Once plugged in, operation of the motorized screen was flawless, the screen stops moving at the click of the button and any adjustments are made with ease. I have not seen any need yet to adjust the tension yet, as the screen is perfectly flat, no rippled regions or anything close to resembling a non-smooth surface. This screen has a white aluminum casing that feels quite strong and durable. The IR for the remote along with the plug is located on the left side of the screen. The remote takes two AAA batteries, and there are two remotes plus a stationary switch that can be wall mounted. On the remote, there are 3 buttons, Up, Down, and Stop. Early on with the screen I utilized the motor much more, as I have a dog that sleeps in the same room and who was not quite used to the screen. I did not want him to be tempted to try and jump up and yank the screen down. As of recent, he shows no desire to do something so counterproductive to his livelihood, and my wife does not mind, so the screen stays open most nights at this point! That said, the motorized feature was pretty important to me to have, it works excellently, and it truly is far quieter than I ever expected. If there was ever a couple people talking in the room at normal volume while you moved the screen down, you likely would not hear the screen moving over people’s voices at all. That’s pretty quiet if you ask me. The screen is supposed to have the ability to set a stopping point so that your screen stops exactly where you want it every time you open it up. Unfortunately, being a new parent has left me very little precious time for myself to set this up and try it out. If and when I manage to get around to it, I will have this review updated to reflect as much. But why do you actually get a nice expensive screen to pair with your projector??? Of course, For The Picture!!! 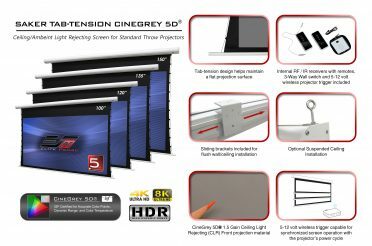 The Saker Tab-Tension Series Elite ProAV delivers on exactly that. First things first, going from a light gray wall to a Maxwhite fiberglass material, I was not too sure exactly stark the difference would be. 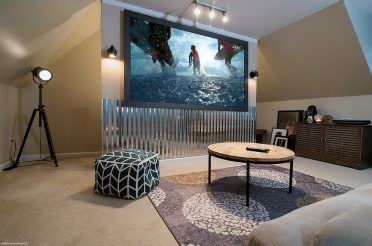 In my mind, the painted wall had served me well for 7 years (until last year when I got my current home theater projector, I was using doubling up on the use of my business/education projector for home viewing. Back then, I felt the walls were delivering a perfectly acceptable HD image with fine details being easily visible on the natural surface, especially with the lower performance of a business projector. So while a true quality screen was obviously something I desired, I didn’t consider it a necessity because I’m not too greedy. A solid HD picture is a solid HD picture, right? Wrong. At least, I would amend that to say, not all solid HD pictures are created equal. Projection on a white or gray wall? Solid, acceptable, and good color, but nothing eye popping. Projection on the Elite Screen Maxwhite surface. Right away, the first thing I noticed was the modest extra brightness you get from the 1.1 gain. The light from the projector bounces right off the screen and back at you with bold, bright colors. 1.1 isn’t a lot of gain – rather minimal, but then most walls are off white not pure white, and therefore below 1.0 gain. You can tell the difference pretty quickly as the wall simply absorbs much of the light and you get almost a more dull picture. Still plenty bright for viewing, but missing that extra clarity that suddenly became apparent within moments of trying out the screen. The next thing worth noting is the standard black masking borders. They enhance perceived contrast and absorb projector overshoot. This is something I was intrigued to see in action. The borders do a very good job absorbing any extra light from the projector that overshoots the screen. That is a definite plus! My family room has four large windows with lots of room for ambient light to come in, currently the windows only have blinds and they do not keep out the light well. In addition, more light comes into the room from the kitchen to the right side of the screen. For this reason, I had guessed I would be served best with a white background screen, but a part of me preferred the ability to get some deeper blacks with a Cinegrey screen. As it stands, based on what I know of screens, I am confident that the Maxwhite was the right choice for this room, although I also considered an ALR type (ambient light rejecting) screen, because of the windows. To hammer the point home on the performance of the screen in bright light, afternoons of football utilizing DirecTV’s game mix channel is pretty much my Sunday ritual during the NFL season. Let’s set the standard here: I can I make out the numbers on the jerseys so I can track my fantasy football teams? That’s more about my projector’s resolution than the screen, but the point is the net result is a bright, clear image. With my 120” Elite Screen, the 8 game channel has smaller screens of about 24” each, and on the 4 game channel, the screens come out to about 36”. Obviously the 4 game channel provides way better clarity given the bigger screens, but then I can’t watch every game! So to sum the performance up here using the standard I set above, prior to my Elite Screen, using nothing but the wall, the DirecTV game mix channel performed well. But I typically only used the 4 game channel because I wanted to track my fantasy team and the bigger screen size ensured I could most easily see which players were making plays. Enter my Elite Screen, with the sun blaring in the middle of the day in September, and I can confidently put on the 8 game DirecTV game mix channel and see each game clearly enough that, I can indeed read the numbers on the jerseys, even on the brightest of days. All in all, I couldn’t be happier with my Elite Screens Saker Tab-Tension EliteProAV. It is a great, moderately low priced (for its size) screen that will impress your guests, provide you a bright, bold picture, and, I expect, based on the build quality – that it will last me many years to come. 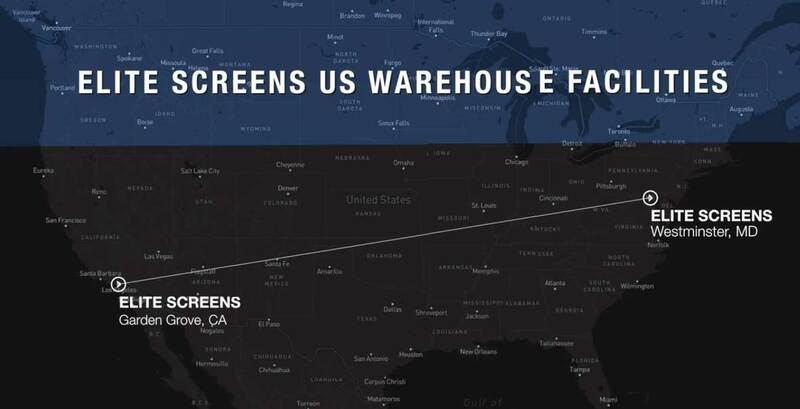 Elite Screens has clearly built a reputation in this class of screens delivering quality, durable, and functional products at relatively affordable prices leaving the average user the perfect choice for their first screen.